Sometimes looking in the rear view mirror is interesting. 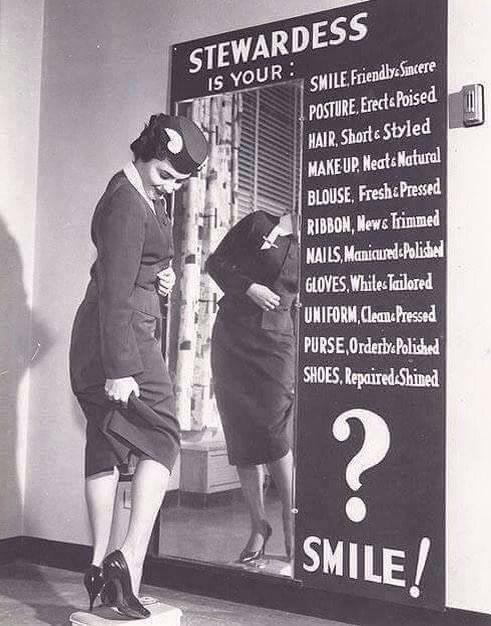 These are some of the rules and regulations about flying and about Flight Attendants (FAs) that were common in the airline industry 50-60 years ago. I call these “Airline rules from the Stone Age”, and I mention them because when looked at in a modern light, it is shocking that we ever permitted these practices in any workplace. Smoking: Everyone could smoke, and most did. Except during take-off and landing. Pregnant: Once they found out… See above. So why am I mentioning all these outdated, ancient, ridiculous (medieval, archaic, stone aged) practices that used to be common in the airline industry? Because these rules HAVE NOT gone away. There are airlines today (MAJOR AIRLINES) that still enforce these outdated rules on their cabin crews, and a few ‘modern’ airlines have employee rules that are even stricter than these old examples, even when their employees are off duty, at home, and out of uniform. It amazes me that passengers buy tickets to fly on those airlines! Good solid upstanding normal people who in their daily life might even claim that they support labor unions, uphold freedom of choice, and believe in personal liberty, the pursuit of happiness, and an independence from tyranny. Yes, You. I mean you! People just like you are supporting these airlines. I do not expect everyone to know everything about every airline. But take a step up on a moral platform, do yourself some good, and help the world. Read up about the business, employment, and labor practices of any airline you are thinking about flying with. Sure, maybe you can save a few hundred dollars with a super low fare. Maybe you insist on being pampered in their newest and most exclusive airport lounges. Their seats that turn into lie flat beds, those are just what you think you need on a 10 hour flight. Those amazing 4 course dining experiences they offer with champagne and smoked salmon. A privacy screen? Personal service? Liquor served even in coach? Get Real! There’s a hidden price on some airlines to many of these perks. Think about what you are really doing when you buy that ticket. In too many cases you are supporting, and therefore promoting, modern day slavery. That’s what it is. Slavery. There is no other word for how some of these ‘modern’ airlines treat their cabin crews. In some cases, you are flying on an airline whose crews have no rights, who can be fired for having kissed someone in public, or for whom it is illegal to join or to form a union. Then there are airlines that can (and do) offer ridiculously low fares because their governments subsidize their flight costs, so when you buy that ticket you are contributing to job losses on all of the airlines that don’t get those same subsidies. Don’t be a fool, don’t get fooled, and don’t be ignorant. As a passenger, you need to open your eyes wide, face the truth, and look around. There are multiple airlines with practices and policies that should not be supported by anyone with a shred of personal morals. More airlines than you might suspect. But you have to learn about them. Oh but not ‘this’ airline you say, or you hope… But what do you know? Do you really know anything about the airline you are flying with? Since the airlines will not tell you about any of this, there are some links below to help you learn the truths. And I encourage you to dig deeper, on your own, uncover your own links, and decide for yourself. Spend 15 minutes before you buy your next ticket and investigate an airline. As one example, a travel reviewer gave a positive inflight report for an airline because its FA work rules result in it having exceptionally young and attractive women for cabin crew: “Anyone who has ever flown with United or American Airlines will know what I’m talking about… Grandmothers shouldn’t be working as cabin crew anymore.” Excuse me, but what!!! He thinks it is a good thing to fire a female FA because she is too old? What if it was your sister who was fired just because she turned 32? Do you really want to support that airline and “that” kind of a business by buying a ticket? Maybe you do if you are a modern Fred Flintstone, but not if you call yourself a civilized human being. Example… Low Cost carrier Norwegian Air isn’t actually registered in Norway, because their labor practices violate Norwegian labor laws. Example… At Qatar Airways, male and female staff while in uniform can not ride together in non-airline transportation, including taxis and private cars. If caught doing so, they are immediately fired. Example… At Air India Flight Attendant applicants can not be more than 24 years old. Example… At Philippine Airlines, Women applying to be FAs must be single. It is in the application. Example… Saudi Arabia airline forbids hiring Saudi women for cabin crew, but will and does hire women from other countries. But only as FAs, because female pilots are still not allowed at that airline. Example… Aeroflot is now in court, being sued by a Flight Attendant, after they tried to link pay to uniform dress size. Larger sizes will get less pay, encouraging them to quit. Example… Air India grounded 130 female FA’s as “unfit to fly” because their body mass index (BMI) exceeded 22 (up to 25 is considered normal and healthy). Example… Qatar CEO Al Baker; “The average age of my cabin crew is only 26” he boasting from the stage while announcing a new route from Dublin to Doha. I just ask that you do your own research before the next time you fly. PLEASE! Then grow up, take responsibility, and boycott those airlines that still want to operate in the Stone Age. Let me know. Do you agree or disagree? Will you allow this behavior to continue? This entry was posted on March 29, 2015 by jlroehr in Passenger thoughts and tagged business practices, Frequent flier.